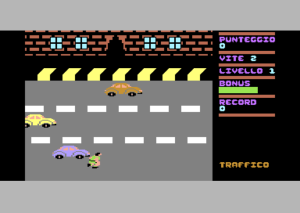 Traffico is a revisited version of an original basic frogger-like game that was published in Italy by Gruppo Editoriale Jackson. 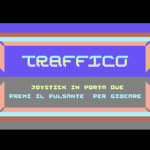 Francesco took the game, added music, a nice intro, modified sprites and graphics. 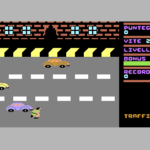 He also compiled the game with AustroComp, so that it became a lot faster and smoother to play. The original in BASIC was far too slow. 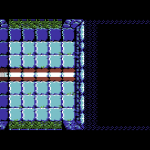 We’ve added the original game (on TAP image) as a comparison. It’s a game that may not hold your attention for too long, but it is yet another title now preserved.